What are the parts of a nail? A set of natural-looking nails are something most women dream of...and today we're going to help you make this dream a reality! 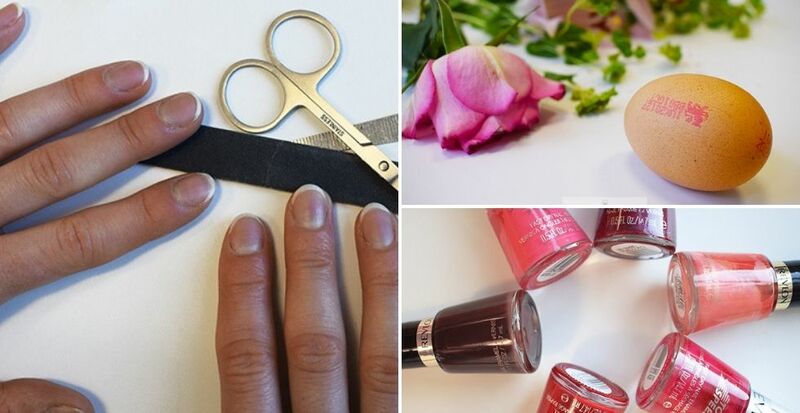 Learning how to grow your nails goes way beyond polishes and filing. The nail is a complex thing and in order for it to grow and strengthen, it must be cared for and nourished correctly. Editor's Note: This post was originally posted in August 2016 and has been completely revamped and updated for accuracy and comprehensiveness in January 2019. Knowledge equals power and nails are no different. Better understanding of the different parts of your nail means better understanding of what they require to grow and long and strong. Your nail might look like one solid sheet, but it's actually made up of several different parts and layers. The layers are made of a protein called Keratin, which is also a component of hair and skin. 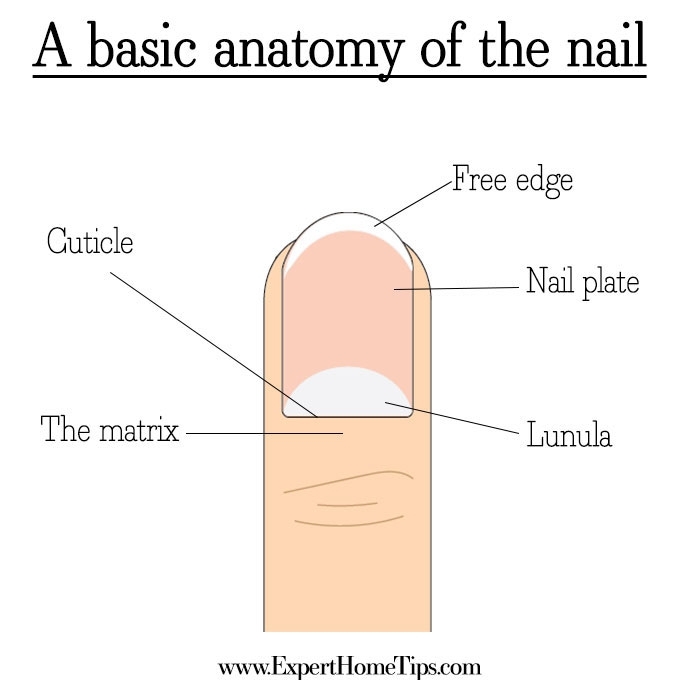 The half-moon at the base of your nail is called the Lunula, and the slither of white that lines the top of your nail is the free edge. We'll discuss the matrix and cuticle in more detail later on. Nail growth isn't as simple as you'd expect. The part of the nail visible to the human eye is actually dead. The section at the base of the nail, the matrix, is the only area which contains living cells. Nails grow from the matrix, where new cells are produced. As new ones form, they push old ones along, increasing the length of our nail. Once these living cells lose contact with the root, they die, which is why we feel no pain when cutting or trimming our nails. Growing your nails requires learning how to take care of both the matrix and the nail bed. You won't get long, strong nails overnight! Metabolism and blood flow - physician, William Bean, discovered his nail growth rate slowed significantly after the age of 50. Injury - an Oxford dermatologist named Rodney Dawber saw a lesser rate of growth in a hand that had been injured in a rugby match, than the other, uninjured hand. This suggested that the prominent hand achieved a faster rate of growth, as the blood vessels were more stimulated. Usage - how often we use our body parts could also explain why our fingernails grow faster than our toenails. While more active fingers, a higher metabolism and avoiding injury may indeed contribute to longer nails, they're not very reliable or realistic methods of growing yourself a set of fabulous fingernails. It's time to find out what you can do to improve your nail health and get the nails you've always dreamed of. Regular filing is essential to keep nails strong, prevent tears, and promote growth. 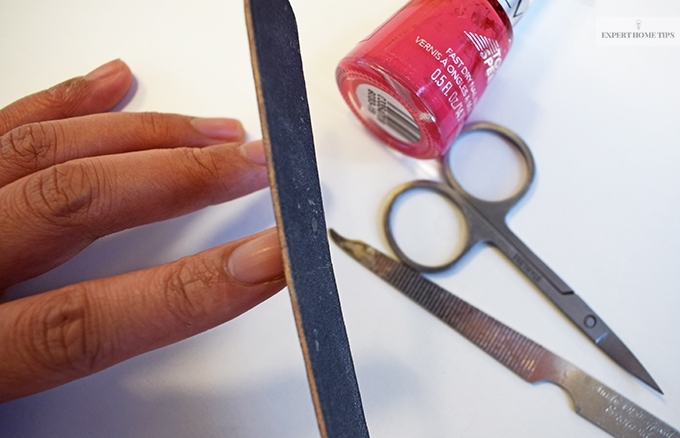 An ideal emery board shouldn't be too rough, as this can lead to small fissures and cracks that cause your nail to tear. Instead, go for something semi-smooth that can be used to gently and slowly file your nail down into the desired shape. Have you noticed that your nails look almost opaque after cleaning the house? The chemicals in the majority of cleaning products will have an adverse effect on the strength of your nails, causing dryness and damage - just as they would the skin. Wearing a pair of rubber gloves is an easy way to prevent this and help you on your quest to grow long nails. Regular maintenance is essential if you're after fine looking fingernails. 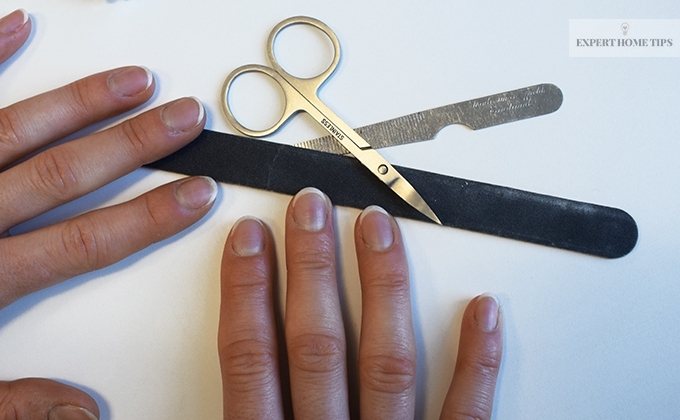 Despite what you may have heard, cutting your cuticles is never a good idea. The cuticle is the layer of skin that covers and protects the matrix (remember, this is where the new nail cells grow from) so it's important to care for it properly and keep it intact. By removing it completely, we leave the matrix exposed to germs and bacteria, which can lead to fungal infections - not exactly the modelesque manicure you had in mind! These infections will lead to weak cells and dimish your hopes of growing long, strong nails. We're not done here yet! Keep learning how to get long nails with more great beauty tips below. Instead of removing your cuticles, focus on caring for them. Without any TLC, they'll become stiff and may also get stuck to the nail plate, preventing them from doing their job properly. In order to keep your cuticles supple, matrix protected, and grow healthy new nail cells, you should moisturise your cuticles daily. They should also be gently pushed back on a regular basis - a process most easily carried out after you've showered and they have softened. The key to natural nails is natural goodness! We know that vitamins are good for us, but with regards to nail health, it's a particular member of the vitamin B family that will really do wonders. Biotin has been found to increase nail thickness in several studies. A thicker nail means less chance of breakages or splitting so your nails will stay longer...for longer. If you're worried you're not getting enough, why not try taking a daily supplement of 2.5 mg? It'll help your hair grow too! You can pick tablets up at most health stores and online too. Are you guilty of turning to your nails when you need to scratch off a stubborn sticker or remove a stuck object? While your nails may feel strong, the delicate layers are easily damaged! Treating them gently will prevent splitting and flaking and mean you don't have to get those clippers out. Remember, your nails are made up of very thin layers, which means they must be treated delicately - that goes for filing too. Save the sawing back and forth for your woodwork - your nail file should be used in one direction only, with only a small amount of pressure applied to ensure even, gentle filing. After a long, hot soak in the bath, you'll notice that your nails are softer and more flexible. This is OK every now and then, but prolonged or regular exposure to water will weaken your nails and contribute to splitting. When they do become soft, stay away from arduous tasks for a while until they have regained their prior strength. We've all been there: a little hangnail we think will tear away easily ends up taking half of our nail off with it, leaving it half the size it was before. Not only does this process shorten your nail, but it will damage the delicate layers it's composed of too. We know it can be tempting to pull these annoying tears straight off, but you'll do much more damage than good in the process. 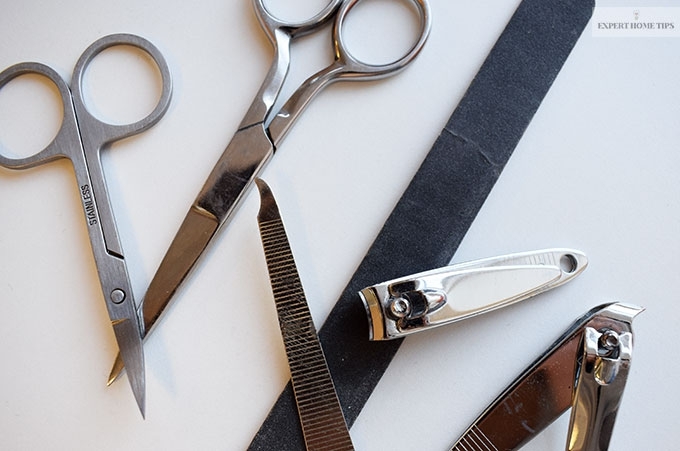 If you're committed to getting long nails, be sure to carry a nail file in your handbag at all times, and you'll never have to deal with the mess - or pain - of a torn hangnail again. They may look pretty, but they won't do nails any good if overused! There's quite a lot of controversy regarding whether a layer of protective nail varnish is beneficial or detrimental to nail health. We know it looks pretty but don't go overboard with glamming up your nails. The chemicals in polish and nail varnish remover don't do nails any good, especially if they're already brittle. Learn to nourish and look after your nails correctly, and you'll find they look just as lovely au-natural. It may be last but it's certainly not least. Like most things beauty, diet is probably the biggest contributing factor when it comes to nail growth. We can't stress enough how important a varied, nutritious diet is to overall nail health. Even if you slack off on your nail maintenance, a healthy diet will always provide the building bricks to start back strong. Protein - keratin, the tough, protective material our nails are made of is a protein, which is why eating enough protein is so important to nail growth. Ensure you get the recommended daily allowance of 0.8g per kilogram of body weight. Fruit and vegetables - fresh produce contains many essential nutrients, including many vitamins and minerals. Magnesium - pumpkin seeds (sigh) and dark chocolate (wahoo!) serve as all-natural anti-stress solutions, preventing things like ridges from appearing on your nail plate. Seafood - prawns and other shellfish contains heaps of zinc, which is essential in the biological production of the protein which forms and maintains nails. 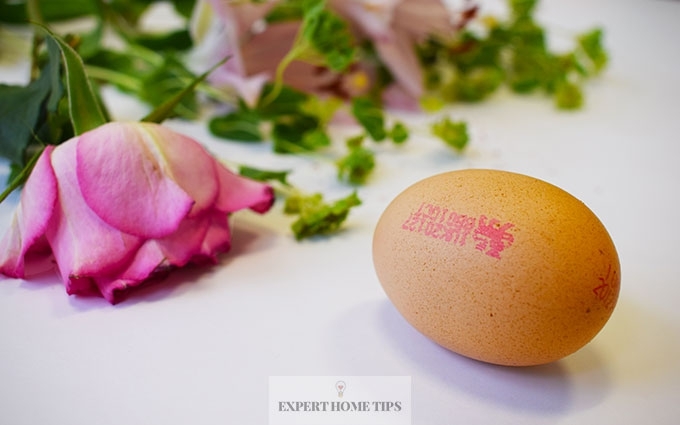 Eggs contain the magic Biotin vitamin that does wonders for our nails. Biotin - Remember that biotin we were talking about earlier? Well, it can be found in one of our favourite breakfast foods - eggs. The most important things to bear in mind with regards to growing long, strong nails is that they are just as much a part of you as any other body part. Just as your teeth will rot if you have a poor diet and don't brush them, your nails will grow weak and grow less if they are not cared for. If you're really determined to get gorgeous nails, nourish your body and your nails will be nourished too. Once they lengthen, look after them - it really is that simple! How much do your nails grow in a week? The average nail grows around 2-3mm a month (so around 0.6mm a week) however, some people find their nails growing at a much faster or slower rate. Is Vaseline good for nails? It is thought petroleum jelly such as Vaseline could help benefit the nails by preventing moisture loss and nourishing cuticles, helping them to grow faster. Does toothpaste help nail to grow? There is no scientific evidence to show that toothpaste can make your nails grow faster. However, some people claim when scrubbed onto nails, it whitens them to improve their appearance. But jelly has collagen and hair and nails need lots of this as we get older and make less naturally. Your article doesn't mention collagen. I've had strong white nails since I was born. I've found that drinking milk (straight not in a tea or coffee) keeps them bright white and strong. I've only ever snapped them once and that was because someone at work dropped a box of 12 (1litre) orange juices on them. I wonder if you should warn readers about nail bars? Most of the nail "technicians" are not manicurists, they might have been trained to apply gel/shellac and stick sequins on but any training about the actual nails is pretty basic and they do not know how to file nails properly. They have a limited time with each customer, so quickly saw nails back and forth with an emery board to reduce the length as quickly as possible. In my area they are concealed by a surgical mask and do not speak English, so very difficult to communicate with. I should mention my nails are long and strong but 2 years ago a "technician" pushed back too hard on one of my cuticles. It was very painful at the time and damaged the nail bed, since then the nail only grows to a certain length and then breaks on the nail bed giving me weeks of pain before I can take it off and then weeks of looking odd with a short nail. Hi Norma, Thanks a lot for pointing this out. You do really have to be really careful with nail technicians, as you're right when you say they often have to rush through clients and don't always use best practises. I hope my blog post helps people to realise the right and wrong ways to care for your nails, and therefore makes it easier for them to recognise a good nail technician from a bad!? I prefer natural nails and have never been keen on the idea of acrylics, gels etc after seeing my friends nails ruined at one of these so called salons. I have long,natural healthy nails with using really good products, OPI avoplex cuticle oil and hand cream and Nail Envy which is brilliant. Also wearing rubber gloves to wash up. My nails are the best they'very ever looked with these treatments. Hi Christine :) I've never tried fake nails or gels either - the occasional nail paint is all I go for - and my nails have always been strong because of it. Thanks a lot for sharing some of the products you've seen success with - maybe I'll try some! Also, be gentle when removing gel nails or acrylics. Using force to remove nail enchantments could ruin your natural nails so it's important to use the least aggressive method. Hi Stephanie Em this will sound really weird but my digging your teeth into the top of the nail and repeating it seem to make them grow?? Diet and state of mind can have a huge effect on nails. I became vegetarian over 40 years ago, prior to this my mails were brittle and flaky, however a few months after turning veggie I noticed how strong they had become - and sill are. When I go away on holiday for any length of time my diet inevitable changes - still veggie - but many countries and cultures have a different way of doing things, and this has an impact on my nails. I can tell when this change takes place by the horizontal ridges growing from the nail bed. This is also true if I get stressed, which isn't often, but I was caring for my very elderly mother until her death a few months ago, and my nails, although still strong are ridged all the way up to the edge, a clear indicator of the stress I was going through. I can see where the new, smooth nail is growing in (or out!) from the base. I rarely wear nail polish, but buff my nails with a buffer every so often, and never, ever, use a metal nail file. I find a fine emery board is best. Hi Lynn, This sounds like a dietary issue. Are you currently having a varied diet, including lots of fruit and veggies? These are absolutely essential to provide your nails with the vitamins and minerals they need to grow strong. I eat a lot of fruit and veg within my diet. Meats, fish etc. I rarely become ill anymore (docs advised to take vitamin supplements) so I changed my diet instead and eat better which has massively benefitted me however my nails are still soft, thin and break easily! I don't have great circulation in my hands and feet which may not help! Anything i can do?? I love having long, strong, elegant nails but they just never get there! Hi Becky. Do you use harsh chemicals? I find that even washing up can take a toll on my nails. Always try to wear rubber gloves when cleaning, and this should help keep your nails strong. I am 68 and have very long very strong nails naturally. Know I am fortunate! Only get my nails painted at salon, with my own polish. Years ago suffered a bad infection after the girl snipped my cuticle, took so long to heal. Rarely file them, the longer you leave them alone the stronger they remain. Sliver, not slither, that’s what snakes do. Contend not contained. Hi Stephanie, My nails will grow strong and long, but when I polish them (very, very rarely) they become brittle and break and then they start to peel. I now use a non-acetone remover. 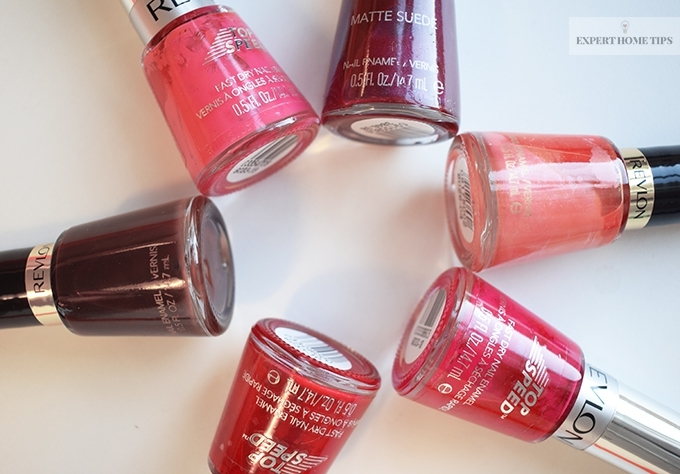 Could you tell me the safest nail polish and polish remover for the few times I do wear polish? I volunteer and sometimes I like to have my nails look nice. Hi Cher. We can't say we know "the safest" nail polish and remover, but anything that claims to be strengthening will help to stop your nails from being brittle and breaking. Hope this helps! Hi Grace! Have you tried the tips in this blog post? Hi Steph. I have only ever seen nail growth when I literally 'hid' my nails under polygel (painted onto tips). In a couple of weeks I saw my nails grow for the first time ever, meaning they are actually capable of growth. I now want to always have polygel tips so that underneath, I always have real nails. It's like my nails can't withstand exposure to anything - even the 10 minutes in the shower weakens them. They peel and split all day, regardless of my being on an excellent diet (all the foods mentioned here), taking biotin, applying top-end hand and nail creams repeatedly and rubbing in coconut oil at night. They still peel constantly and remain thin and short. ls it a bad idea to resort to always having tips? I want to keep the tips because it is the first time in 44 years I have ever seen my nails grow. Hi Shoane! Whilst normally any sort of false nail would damage your nail, it sounds like it's actually helping yours. Ultimately you should do what makes you feel happy and gives you the results you want. We're glad you found something that helped your nails to grow! my nails are very very short...actually i used to bite them a lot but now i've stopped it but they are not showing any growth or they are growing but at a very slow rate...i want to grow my nails within half or 1 one month....so please tell me what can i do?? Hi there, Shirley! What have you tried so far? I hope these tips also work for hair or thinning hair? Btw, I always wondered if nails ever stop growing if one stops cutting them, I read they don't but hair does. But then hair also shed, so they are different in that respect :). Hi there! Some of these tips will certainly help with thinning hair. As for your second question, if you stop cutting your nails, they will continue to grow.